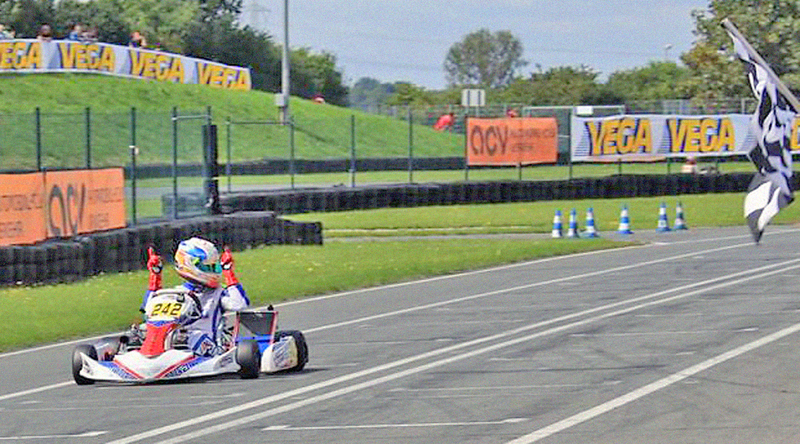 The third racing weekend of the German Kart Championship could hardly have gone any better for Mach1 Motorsport. The factory team of the German chassis manufacturer Mach1 Kart celebrated its first victory at the shifterkarts at the highest German kart racing grade series and belongs to the title favorites now. The fifth and sixth ranked races of the German Kart Championship took place at the etropolis Motorsport Arena Oschersleben. The Mach1 Motorsport team started with four drivers and showed a strong performance. After his second place at the European Championship in Wackersdorf, John Norris belonged to the top shifterkart drivers once again. The field was strongly manned again – numerous European and World Champions were at the start. John Norris wasn’t impressed by this though. Due to a perfectly balanced chassis he set the speed of the field consisting of 43 drivers on Saturday. The Irishman drove the best time during qualifying and also won both heats. “There’s no reason to complain today. John has shown a strong performance and confirms the hard work of the past weeks”, Martin Hetschel explained in the evening. During the first final race on Sunday there was no way of getting past Norris as well. Due to a perfect start he was able to keep his top-class opponents at bay and secured his first victory at the DSKM. “I’m very happy about my victory. The second final race is not going to be easy though. I’ve already started with new tires and am going to have a slight disadvantage now”, explained Norris and was proved correct. During the course of the first four laps he had a hard time keeping up with his opponents’ speed, then the proportions evened out again though and John was able to gain some more positions. Coming in sixth he just barely missed entering the cup ranks. At the Championship he gained a lot of ground and is currently on second place. As second driver, Marcel Schultheiß was back in kart racing. He started again after a racing pause and was able to impress from the beginning. On 19th place after qualifying and the heats he managed to enter the final races directly and drove in the front midfield during the first race. Unfortunately an engine defect caused him to forfeit the race prematurely. From the end of the field, Marcel pushed his Mach1 kart to the limit during the second final race and drove his way forward to seventeenth position. “Marcel’s break wasn’t recognizable, he drove in midfield right from the start and drove really competitive times”, Martin Hetschel praised the shifterkart rookie. The team had less reason to rejoice at the DKM. Manuel Valier and Harrison Newey were slowed down temporarily during the final races and didn’t achieve entering the top ten. “We’ll now have to analyze the situation. Harrison did really well during the heats and would have been able to achieve points at the finals. The fights in midfield cost valuable time though. On 15th and 17th places after the second final race, we did not achieve our goals”, Martin Hetschel explained in the evening. Despite the slightly low yield, Manuel Valier is still close to the top in the Championship and currently on fifth place. The team is going to travel to Oschersleben again in three weeks. The ADAC Kart Masters is going to take place there with the fourth event of the season. Before that, Mach1 Motorsport is going to travel to England first, where Harrison Newey and John Norris are planning guest starts at the finale of the CIK-FIA KF European Championship.